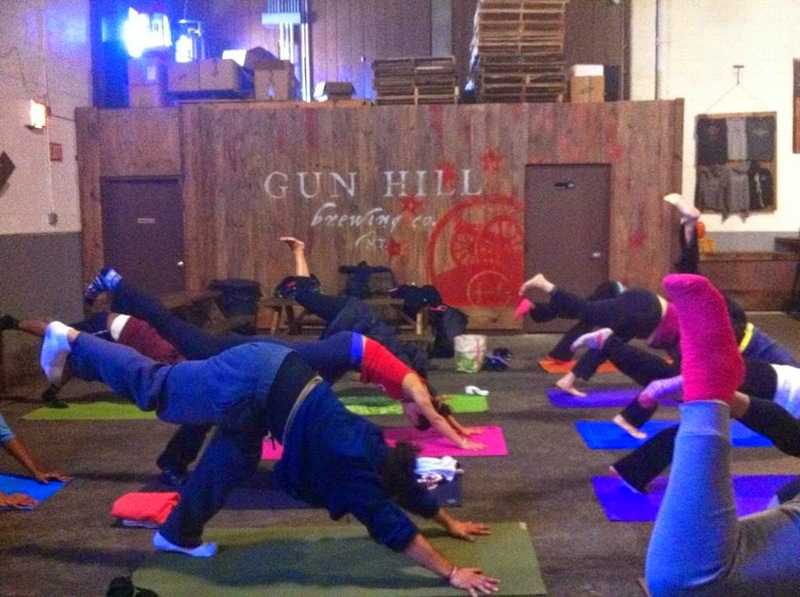 Beer & Bend at Gun Hill Brewery in The Bronx, New York, was an adventure just getting there. You've probably heard about the boogie down, south Bronx, south south Bronx. Birth place of hiphop, and not the best place for tourists to wander around alone late at night, unless getting robbed is on their bucket list. Most tourists, let's be honest, most New Yorkers, that don't live in the Bronx, don't spend much time there aside from Yankee games and the zoo. An hour on a subway train, then forty-five minutes on a bus (because there was construction on the subways, like there always is in New York), then a fifteen minute walk, all worth it. The man pictured above doing the forearm stand is yoga instructor Victor Chaves, he's awesome. At one point he asked us to raise our hands for his permission to grab our bones and muscles. Victor keeps it real, he said "You'll hate me during some of this, and you'll love me during some of this, if you don't do both, then I'm doing this wrong." No joke I definitely had moments of hate (when he said "and hold") and moments of love (when he said "and relax"). Did I travel all this way to have a yogi make me feel the burn? Not a chance, I came for the beer! 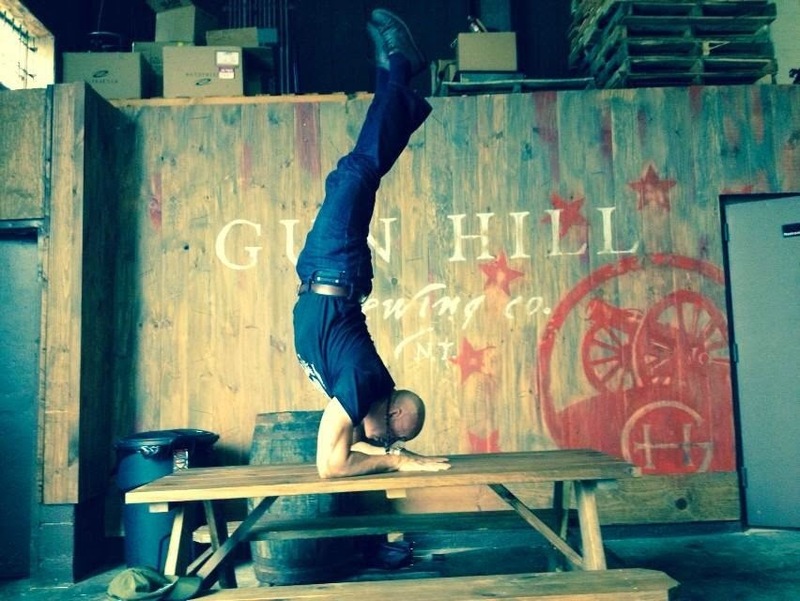 Gun Hill Brewing Co. has only been around for a little over a year, but they are already multi-award winning brewers thanks to their Void of Light. Its a stout so dark you can shine a flashlight on it and you'll see no traces of it through the glass. 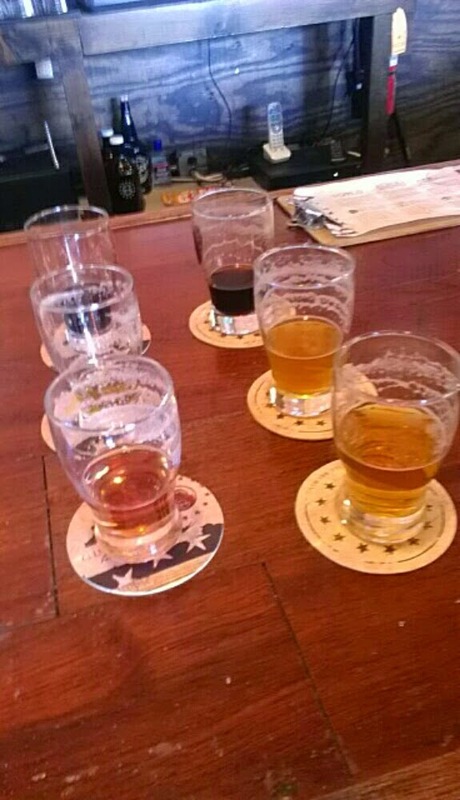 I did a flight, naturally, I didn't travel two hours to try one beer... I needed to try all six. An IPA, a black IPA, a golden ale, a pale ale fundraiser beer from Washington State brewery Boundary Bay, and my favorite of the flight, Cherry Tree. Cherry Tree is a red, pretty sweet but well balanced. I got a tip from a local, ask the bartender to mix the Cherry Tree with the Golden. Some places will chop off your hands for mixing their beers, but some of the bar keeps here are known to take a growler home of this delicious concoction for themselves. 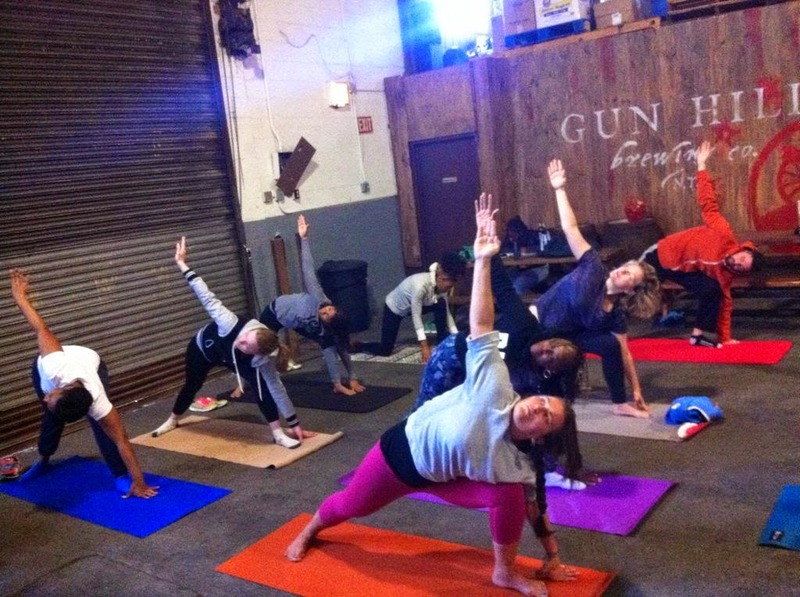 Beer & Bend is every Saturday morning at 11am right there inside the Gun Hill Brewery in the Bronx. This brew loving, flexible as a rusty tin man, Bronx tourist, approves of the beer and the yoga here. Do you know of any other breweries that do beer and yoga events? If so please post the info here in the comments.